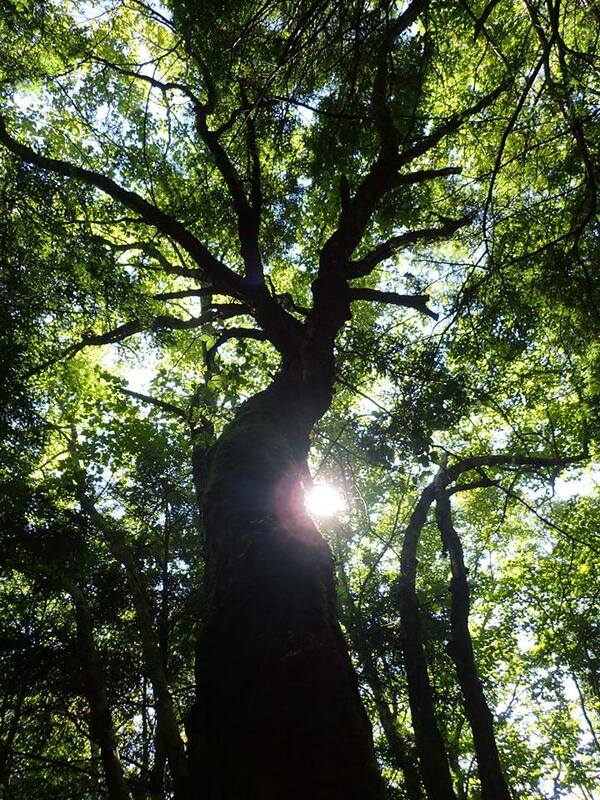 These observations by experienced naturalists of features of Old Growth provide can help us help “open our eyes” as we explore out own forests. researchers – a forest of small and less mature trees is easy to recognize as non-old growth without need of any other method. Old growth experts can quickly distinguish very mature forests from old growth forests using experience and visual observation of physical indicators without needing to measure tree ages.  Is it poor growing conditions (slow growth)? If so, small diameters could still mean very old for that size tree.  Is it rich growing conditions (rapid growth)? If so, large diameters could mean trees are not as old as they look, not necessarily old at all. Matching with type of tree species (trees fall into fast, medium, or slow growing categories) and presence of old growth indicators below will determine answer.  Include medium to large black walnut, cedar, black cherry, white pine –excellent sign!  Lowest bough starts at 25 to 40 feet up, or even as high as 60 to 90 feet! 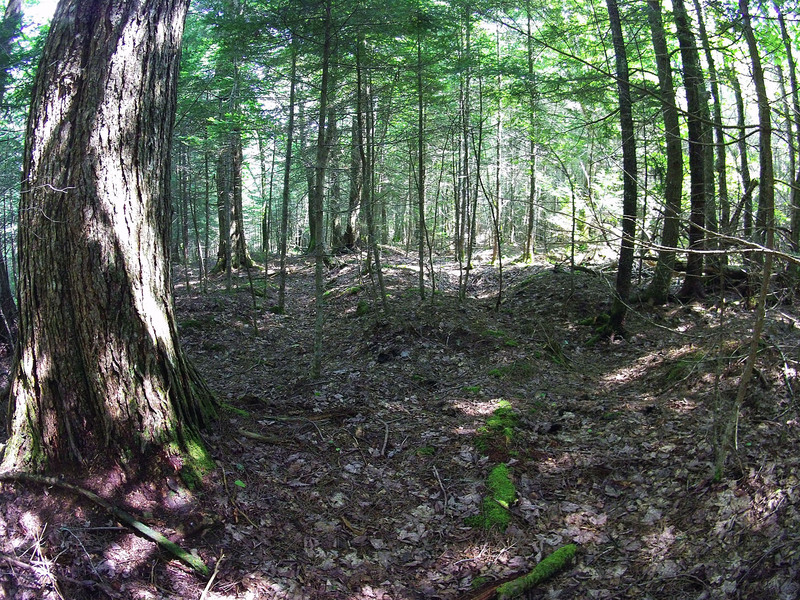 Pit and Mound Shapes on the Forest Floor.  Depressions and mounds, 2 to 4 foot deep and high, are only caused by toppling of large trees in the long-ago past, which then decayed away to leave “grave monuments” as reminders they were there. If large trees grow among pitsand-mounds, it ensures a continuous time period of many centuries that large trees have made up this forest.  Created by large standing trees that fall here and there over a long period of time, with the older logs reaching greater stages of decay. In contrast, logging (actually “de-logging”) in the past removes large trees that would otherwise contribute to the supply of older logs. Absence of logs, however, does not always imply anything. conditions for soil colonies of fungi to grow undisturbed, and no shocks from the introduction of bright light or drying conditions caused by logging or natural disasters. 51 species of lichen grow only in Old Growth Forests. Scarce fungi, moss or ferns does not imply much. 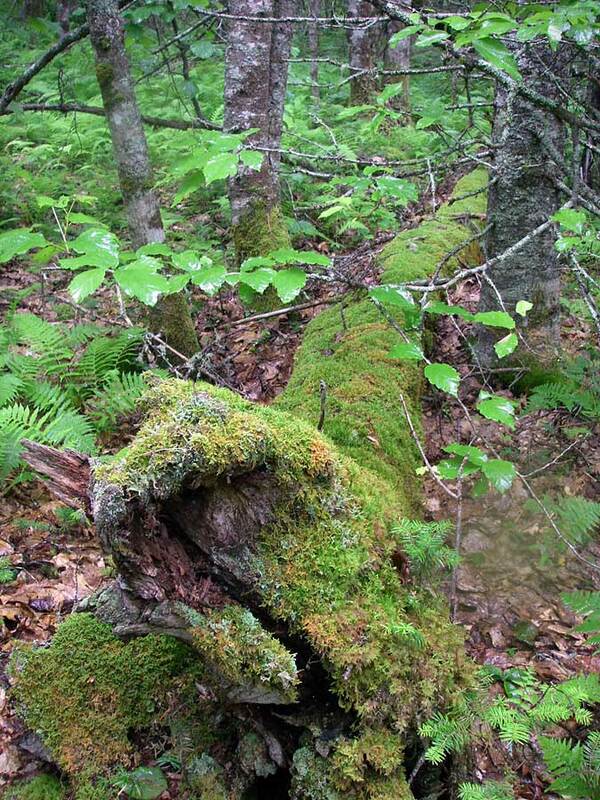  A few, scattered stumps or minor signs of the above disturbance-indicators does NOT rule out an Old Growth Forest. It just indicates that it had some past disturbance. Presence of planted or non-native trees, such as Norway spruce, Scotch pine, tree of heaven, Norway maple. – Walking into an old growth forest in Maine, the thing you notice is the trees are bigger, but there are fewer of them. If you hold your thumb out at arm’s length and spin in a circle you should “pick up 10 to 15 trees that appear as big or bigger than my thumb,” said Whitman. – But there should also be younger trees, trees of various heights and ages, helping create a multi-layered canopy, filtering the light falling toward the forest floor, they said. Old growth does not mean all the trees are old. – The big trees should be plastered with lichens and festooned with epiphytes. Expect to see lush mosses and plants such as Coral Root and Indian Pipe. There should be liverworts and lungworts and a complex of mosses, including the Feathered Neckera, a characteristic moss of old growth forest. Below, in the spongy duff and under the many logs, you should find a variety of beetles, worms, spiders, millipedes and centipedes. You might hear pileated woodpeckers or catch a glimpse of a fisher in a tree. 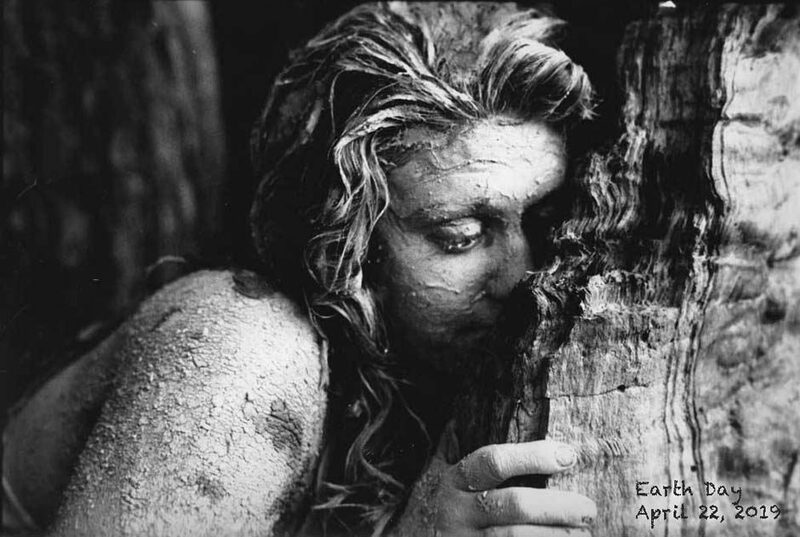 – One other telltale feature of an old growth forest is the forest floor itself, said Whitman and Fraver. It’s not, by any means, level. Instead it’s characterized by dips and mounds. Not coincidentally they’re more or less the size of a large tree’s root ball and its accompanying soil. This “pit and mound” topography occurs when old big trees are blown down, their roots upended. The mound is created by the exposed root ball, the hollow is where it once was. Gradually, over decades, the root rots and both the mound and pit are colonized by mosses, ferns, wildflowers and young trees. It is multi-aged, old growth oak forest with snags (standing dead trees) and fallen dead trees in a range of diameters. The overstory is made up mostly of red oak, some yellow birch and occasional white birch; red maple is common but tends to be overgrown by oak. There are distinct subcanopies of moose maple at about 7 – 9 m (20- 30′) height and witch hazel at 3 – 5 m (10- 15′) and a continuous low bush groundcover, typically less than 60 cm (2′) height. The groundcover is made up of blueberry, huckleberry, New York fern, bracken fern, lambkill, sasparilla, mayflower, Labrador tea (in pockets) and seedlings of red oak, red maple, moose maple, yellow birch, fir and occasional black spruce. We didn’t see any pine. Balsam fir is common on the forest floor but, except in a few larger gaps, does not grow more than about 3 m (10′) in height and then, apparently, dies.